Unique design Solar LED bollard garden light luminaire with integral with integral battery box, charge controller with automatic operation and top mounted solar panel. Solar LED Garden Light has a high power LED and solar panel to give hassel free lighting at night. The light has an automatic system that enables it to switch ON at night & switch OFF during day. 2. 5 ft pole ht. - High quality M.S. construction duly powder coated. - Easy to install, no wiring required. - Ultra bright white LED with 100, 000 hours life expectancy. - Premium quality crystalline solar module. 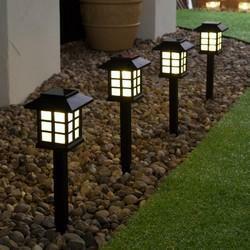 Our company is the foremost name in offering a vast array of Solar LED Garden Light. Traditional solar system includes so many parts: traditional lamp ( or LED lamp), solar panel, lead-acid battery, controller, solar panel brackets, battery cabinets. The volume is very large, therefore freight charge is very high, and labor cost of mounting is also very high. Solar LED Garden Lights with SS Body and pole. 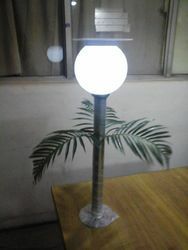 We are highly acclaimed in the industry for offering an optimum quality range of Blue LED Solar Garden Light.